Today going on camping does not mean to leave the comforts of home. Actually, camping becomes like living in a home which is away from home. When it comes to enjoying the camping, several activities hit upon our mind like- enjoying the moonlit night under the stars, a natural waterfall or having a bath in a lake or sea water, etc. Nowadays you can take a camping shower with you to have a shower or washing dirt and grime. Again, having a portable shower for your own can be a significant advantage if you do not find any resource of water on the camping spot. Here we have listed the best portable camping shower including their pros and cons to help you decide which is best suited for you. So, we hope you will consider to have a camping shower next time when you are planning for going out on a camping trip with your family or friends. 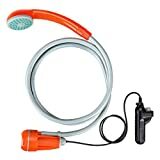 If you are a camper who loves shower or likes to keep clean when camping, then you need to think about your own portable camping shower. A camping shower is a great relief whether there are facilities for water or not. 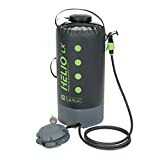 A best portable camping shower can be used for many other purposes such as- cleaning cars, dishes, pets, outdoor gears, and personal cleanliness. Before choosing the camping shower, you need to think about your own camping needs and style that only depends on you. 5 Gallon summer shower powered by solar technology is designed with efficient 4-ply construction with reflector panel and insulator panel. This premium quality shower comes with an easy to use ON/OFF showerhead and an extra-large filling valve which makes filling easy. It also features a side pocket for soap and shampoo, temperature gauge and velcro straps for washcloths. It is an ideal shower for summer camping and made with PVC free premium materials for superior durability. It can be listed in your camping gear list on your next camping trip. It can be rolled up after use for easy and compact storage. It weighs 1 pound 4 ounces. Camper needs to take a lot of water. 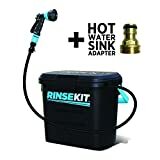 The RinseKit Pressurized Portable outdoor shower is great for the hose down everything from you to your kids, gears and pets. As it is sized like a drink cooler and can be stored easily into a trunk or back of a car. So, it is great for camping as well as outdoors. It can be used to clean up the garden and car too. It can be taken to the sea-beach or fishing to wash off sand or rinse the mud off before getting in the car. Besides, it has great use of cleaning dishes and taking a shower during camping without any pumping and batteries as well. This pressurized shower can deliver spray for up to three minutes and store the strength of a regular household spigot on a sink. It can be filled quickly with hot or cold water. This portable shower can hold up to 2 gallons of water. Its spray nozzle designed in a way that offers seven different settings from the jet stream to soaking shower. It features a folding handle for one-handed carrying and easy to remove the lid to stand on for changing. It comes with a built-in ruler to measure fish, a hose nozzle, 6′ hose, hose bib adapter, on/off valve and quick connect. As it can’t heat water itself, so you can put it in the sun for a warm shower. Ivation portable outdoor shower is a well looked colorful shower. It can amazingly transform any water ready for the shower. This lightweight shower can instantly turn any sink or bucket water into shower stream. This reliable, as well as portable shower, features one simple flow rate which provides comfortable bathing for senior, babies and pets. It incorporates the shower pump with a built-in rechargeable battery and shower head into one unit. The showerhead with suction cup can easily stick to any flat surface. It also includes an S-style hook to hang it over your head. This shower is powered by 2200 mAh Lithium battery which can easily charge via a USB cable. This portable and lightweight gadget can easily plug into a laptop or 12-volt car adapter that allows 1 hour of continuous use after fully charged. Its water-resistant unit can even connect to a large water container to increase the nozzle’s pressure. 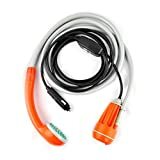 This handly H2O innovation comes with a water-resistant on/off switch, 6.5-foot flexible hose and S-shaped hanging hook for hands-free use. It can consistently stream up 0.66 gals/ minute. This 1.9-pound weighted shower can easily be stored in the backpack or car trunk for convenience use. Its applications are endless. It can be used for gardening, camping and cleaning pets or car. Risepro solar shower bag is an excellent shower bag which offers you hot water shower without any gas or electricity. This jumbo shower with 5 gallons (20 liters) carrying capacity is best suited for wild camping and beach swimming. This deluxe shower bag features leak-proof multiple layers which makes it durable and reliable as well. Risepro solar shower is made of environment-friendly materials which are safe for human health. These smart PVC materials can efficiently absorb solar energy to heat the bag’s the water. It can directly heat the water through the sunlight up to 113 ° F or 45 ° C.
It includes a temperature indicator to get the temperature of the water. It also comes with an easy on/off switch to control water flow from low to high and brings a much better showering experience to you. This lightweight shower bag is easy to carry and store as well. The hole shower pack set comes with a hose with a showerhead, a plastic tube, a hanging strap and a 20L shower bag. The lid area may leak a little bit. The pure clean portable shower is an ideal shower for camping, boating, fishing and pet cleaning. It comes with a built-in pump that is ready to roll out the water at any time. You need to drop its waterproof pump in any bucket or water source and switch the pump on to get water spray. The durable construction makes it convenient to use in the outdoors. This is a hand-held shower which delivers a powerful stream of water for excellent cleaning and saves our time for some long shower. It features 100% waterproof safety and rechargeable pump that can be charged via USB cable. It comes with a USB charging cable, hose, showerhead, suction cup and hook attachment with water resistant spray. This is a perfect tool for all-around cleaning from campsite to pet cleaning. It is light enough to carry. It provides only one water stream facility. Zodi Outback gear battery powered shower is ideal for quick cool water shower or rinsing dishes anytime. This is an ultra-convenient shower with its 4 D batteries and powerful pump. This portable shower is best suited for the house, kiddie pools, washing the dogs, draining water fountains, etc. It comes with an 8-foot shower hose with water conserving showerhead. This is a battery powered water shower with 6-volt battery operated water pump with debris screen. It 8-foot long hose can efficiently work with any water container or water resources. It does not require any dangerous gases and odors. This compact sized shower with powerful pump also easy for storage and transport. The whole battery powered shower system weights 2 pounds and too easy to use. Great for shower, clean-up and washing. Simple portable camping shower offers a way to get clean quickly in every situation. It provides an attachment that turns most of the bottled water into instant showers. You can easily enjoy a bath by holding the shower over your body. It is specially designed to convert one or two bottles into a shower. You can take a shower with 1 or 2 liters bottle without any 20-40 pounds water container. The straw-like tube attached with showerhead can be inserted into the water bottle. The strength of the water stream depends on how fast you pour the water and what angle you tilt the bottle. 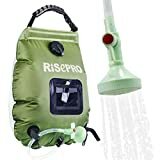 This lightweight, as well as the portable shower, is ideal for kayaking, hunting, camping and backpacking. It is also great for washing pets and sandy beach toys. Nemo Helio portable pressure shower holds more water to provide you a longer shower. You can pump up the pressure yourself with a foot pump to maintain water pressure. It can also absorb heat from the sun to offer you a warm shower. This shower is made of welded polyurethane-coated polyester with 11 liters water capacity. The complete system comes with 7-foot neoprene hose, nozzle, foot pump, compact carrying case. It can provide a steady flow for 5-7 minutes. The whole thing weighs just 1lb 6 oz and measures 5.5 by 8.5 inches. 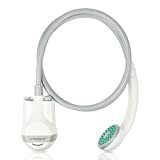 Nemo’s Helio pressure shower is a popular model and comparatively cost less than others. It won Gear of the Year award in 2012 for its efficient performance. Little hard to drain properly to dry out for storage. Suaoki outdoor powered handheld shower is one of the best portable camping showers among all. It is a combination of both portability and workability. It features S-hook and suction cup to help you using it. It also comes with 3-meter power chord and 1.8m hose for adding convenience. You can have this portable shower in your backpack for a comfortable shower. This is a small-sized and lightweight shower which is easy to carry. It offers a water filter system, so clean water will never be an issue for you. This system with showerhead and water pump is less than one pound. It comes with a suction cup and long power cord. You can hang it through the hook and move it according to your need. This shower is best suited for outdoors, camping, pet cleaning, car washing, plants watering indeed. The water pump may get burned while charging. Produtrend is a lightweight outdoor shower kit that can give you a great camping or hiking experience with just a water bucket. It features showerhead and battery-powered water pump at the ends of its long hose. This is a compact shower which is convenient to use and portable as well. Produtrend portable shower is structured for all weather conditions. Its rechargeable batteries also guarantee reliability and consistent use. It can provide 1-hour continuous support for a full charge. This is one of the most versatile showers on the market. It is small enough to carry on the backpack. This handheld shower brings home like comfort to the outdoors. After a long day on camping, if you are interested in taking a shower or washing dirt, there is no alternative for having a portable camping shower with you. And so, you need to have informed choice about camping shower to enjoy the truly wondrous outdoors. In this review, we tried to consider your need and looked for the best portable camping showers that you may like to have. So, if you are looking for a shower to buy yourself, have a look through this review to make an informed choice.